DIOSAS BY FER DIOMEDI in collaboration with TROCADERO ARENA & Carmen Piedad "GROUP 4D · Luxury Services". 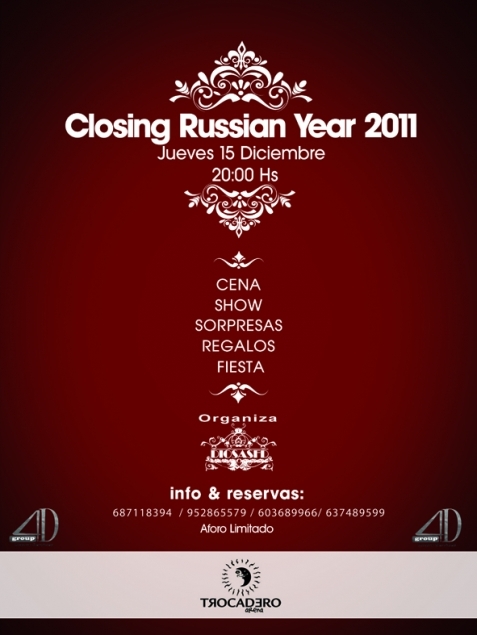 Organize THE CLOSING RUSSIAN YEAR 2011th for Russian-speakers of Costa del Sol and for all the public in general. On December 15th at 20.00h. Let's have a nice time in the environment of our friends and enjoying the delicious food prepared by Trocadero Arena Chef. Call to know the menu you will be surprised !!!!! If you wish to come with your children, under 5 years for free and for over 5 years we have a special children's menu. We also have a "Fairy Godmother" to take care of the kids throughout the party! For your better comfort, TROCADERO ARENA has a large parking and car valet service.